A few years ago while I was in LA in the fabric district, I stopped in at Michael Levine’s upstairs loft store. It’s a non-air conditioned room filled with huge cardboard boxes, each filled to the brim with fabric scraps from the downstairs Michael Levine store. In the summer it’s basically a sauna filled with shoppers bent over the boxes, sweating bullets and digging through the scraps to find fabric gems. And although it takes some effort to dig, I almost always come up with some amazing scrap. This polka dot chiffon was a find in one of those bins, and with it’s $2/lb price tag, I snagged all two and a half yards for about $0.50 total. Definitely worth the dig. 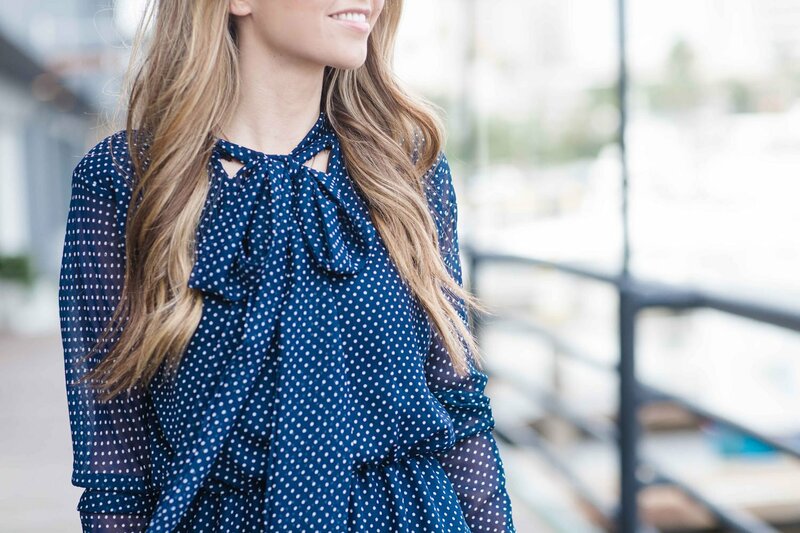 I hung on to the fabric for all these years and last week I ran across a picture of this dress and was instantly inspired to use this polka dot fabric. Now I’m excited to share it with you! And if you don’t know how to sew, grab my online sewing course for only $60 here! Create your pattern pieces. I don’t provide printable patterns, but I have this video that shows how to create patterns using your own clothing. You’ll need a BODICE FRONT + BACK (make sure the back doesn’t have the v-neck front), 2 SLEEVES, 2 SLEEVE CUFFS, 2 SKIRT PIECES, and 2 COLLAR PIECES out of the fabric, and a BODICE FRONT + BACK, and 2 SKIRT PIECES out of the lining. Take your BODICE FRONT pieces (lining and fabric), and pin them right sides together along the V in the front. Sew around the V with a straight stitch, turn the pieces right side out, and press in place. Now take all four bodice pieces (lining and fabric), and sew them together at the shoulder seams with a straight stitch. Make sure they’re stacked in the correct order — lining, fabric, fabric, lining — with right sides of the fabric together. Take your collar pieces and fold them in half width wise (hot dog). Sew down one long side and one short side with a straight stitch. Repeat for the other collar piece. Now turn the collar pieces right side out, press flat, and then sew them together at the open ends with a straight stitch. Take the very long collar/bow pieces, fold the very middle in half, and then line it up with the back of the dress neckline. Pin along the neckline (leave the V part alone since that’s already finished), keeping the collar folded in half until it reaches the V. Now sew along the neckline with a straight or serged stitch to attach the bow collar to the dress. Let’s move to the sleeves. Line up the sleeves at the top of the shoulder and pin along the sleeve opening. Now sew in place with a straight stitch. Repeat for the second sleeve. Attach the cuff to the sleeve. If you need help, refer to this tutorial. Now it’s time for the skirt. Take your FRONT and BACK skirt pieces and sew them together up the sides. Now do the same for the FRONT and BACK SKIRT LINING pieces. Next we need to attach the bodice to the skirt. 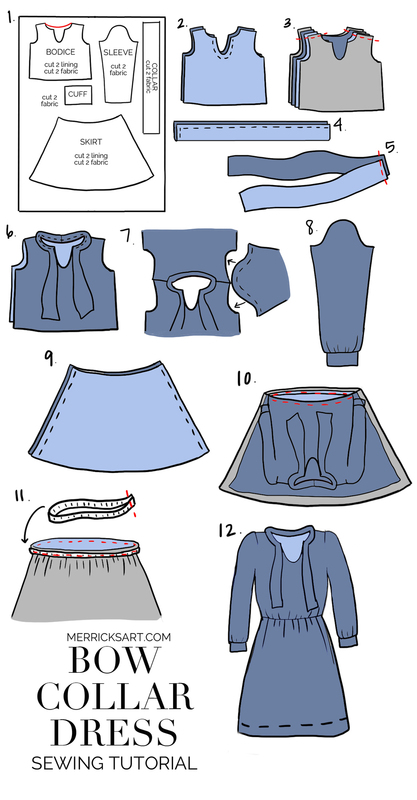 Layer your SKIRT LINING and SKIRT FABRIC and tuck your bodice inside. Make sure the right sides of the fabric are together, and pin in place. all the way around the skirt. The order should be lining, fabric, fabric, lining. Now sew all the way around the waist with a straight stitch. Make sure your seam allowance is about 1/2″ wide. Measure your waist and then cut your elastic to size. Stretch your elastic and fit it around the waistband of the dress. Pin it to the waist seam allowance, then streeeetch as you sew. Once you let go, it will rebound and cinch the waist in. Make sure that you’ve stretched it evenly around the waist as you sewed! Hem the lining and the fabric to your desired length, and you’re done! I cannot even believe you made this!! Wow!! That dress is seriously so gorgeous! I love it! I loved hearing all about the story behind the fabric on your instastory too! You do such stunning work, I love it! And I’m most impressed with the illustrations for the pattern, you’re really talented! 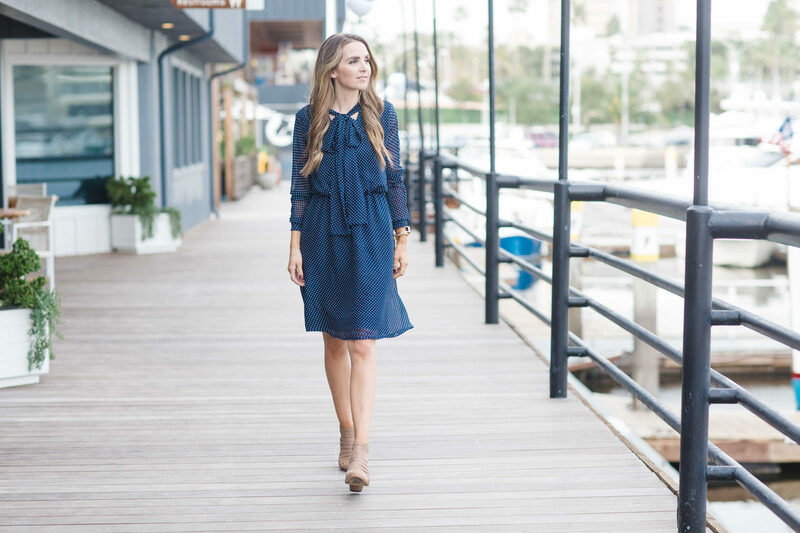 This dress is darling!! You are really an amazing seamstress! I can see you designing your own line someday! You read my mind! I just bought some chiffon to create a bow blouse with! Thank you for sharing your instructions. This will make my project a lot easier!